Maria Montessori Academy - Fairfield Media Co.
Maria Montessori Academy's website had fallen behind in three ways: information layout, design and technology. While the site contained all the pertinent information about the school and the Montessori program, it was not delivered in a way that visitors can easily find the information. Also, the design of the site was dated and is not competitive with other independent schools’ websites. Plus, the technology used to build the website had created the situation where MMA staff could not update the site when desired. Also, the website was not mobile friendly which means that it could not be easily viewed on smart phones or tablets. Finally, the site was not connected to external channels (like Facebook) that drive further engagement and conversions. We went back to the drawing board on how the information is laid out for making the most user-friendly experience. Secondly, we selected a new look and feel for the site to match how the school has changed in recent years and to engage prospective students and their families. Finally, by using WordPress we empowered staff to make updates and contributions to the site when they want, with no additional gatekeepers or fees. WordPress also gives the site room to grow with new features as needs and requirements are identified. 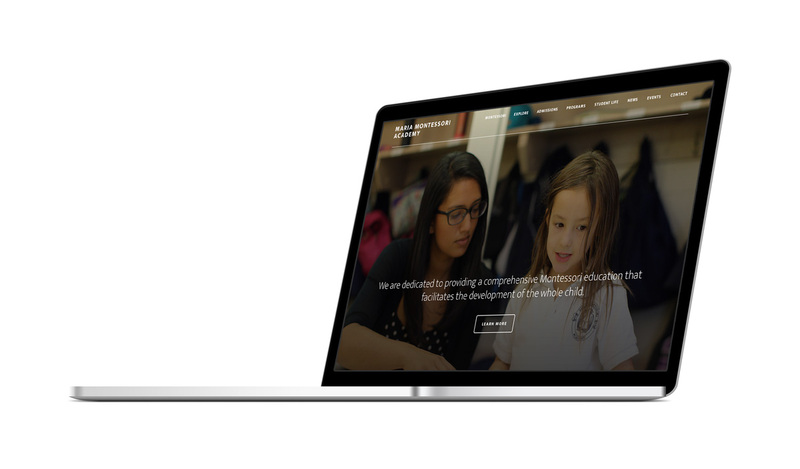 In the end, Maria Montessori Academy have a new site that effectively communicates the educational experience and development program that students receive by attending MMA and learning through the Montessori system. "I would recommend Fairfield Media to anyone who is interested in developing or redeveloping their website. Scott was incredibly knowledgeable, personable and easy to work with. Throughout the entire process, Scott kept lines of communication wide open and was always available to answer questions big or small. I cannot express my gratitude enough for all the work, time and energy Scott put into our website."